Economic efficiency (Ee) is a summary measure that combines production efficiency and consumption efficiency, thus reflecting the economy's overall success in transforming inputs into health. The combination of the two efficiencies is straightforward. Production efficiency is based on potential gains (PV — IC). We now apply consumption efficiency (EV/PV) to the potential value in this definition in order to transform it into effectual value. As with production efficiency, input quantity can refer to a single input or a related combination of inputs. Input cost in this case means the life-cycle input cost of the final output under consideration. The human efficiency measures are summarized in the following figure. Depicted are four of the five efficiency measures that involve health. (Absent is distribution efficiency, which is part of consumption efficiency.) The two most important efficiencies — allocation and economic — are capitalized. 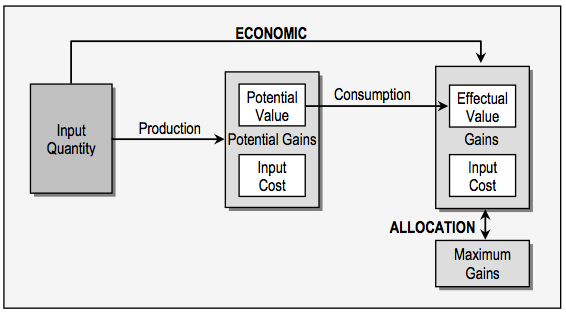 The two efficiencies that are capitalized in the diagram, allocation and economic, are the most important. Allocation efficiency indicates the degree to which the chosen outputs potentially maximize a society's health, while economic efficiency indicates the degree to which the economy realizes this potential through efficient production and distribution. If we ignore environmental factors, the achievement of 100% efficiency in both cases is the definition of a perfect economy. The only ENL efficiency measure not included here is ecological efficiency, which is a technical measure. This means that it does not refer to either value or cost, nor thus to health. The distinction between a human efficiency and a technical efficiency is significant because the increase in a human efficiency will always increase aggregate health, whereas the increase in ecological efficiency may or may not have this effect, depending on circumstances. The three efficiency measures that are expressed as percentages are commensurable. That is, each instance of allocation efficiency can be quantitatively compared with every other instance, and the same holds true for the consumption and distribution efficiencies. Instances of production efficiency and economic efficiency, on the other hand, are commensurable only if the input mixes are substantially the same, where sameness is based on the analyst’s judgment.